What It’s About: A group of West Texas teenagers come of age while their town is slowly dying out, just as the movie theater that stands in for the town must close. Why Watch it Today? 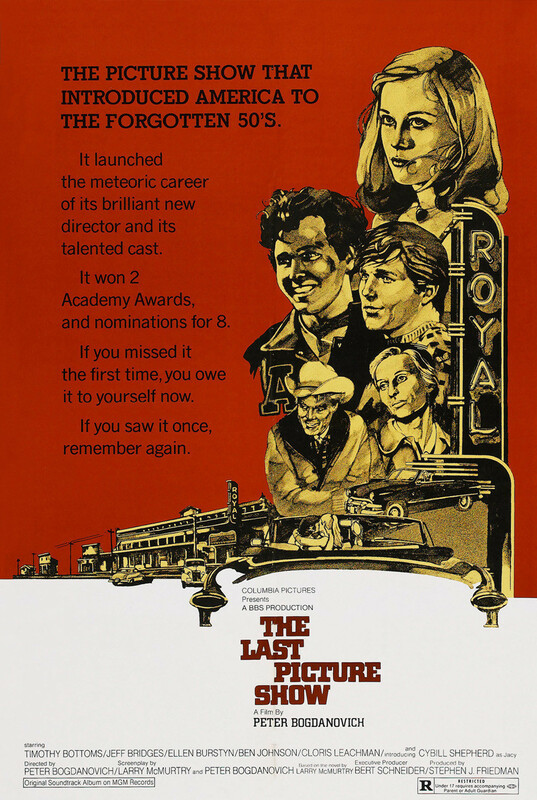 : The Last Picture Show was director and film historian Peter Bogdanovich’s breakout film, his first mainstream film after working for Roger Corman and AIP, a touching drama with an excellent cast of older character actors and young, soon-to-be stars. Bogdanovich was born today in 1939. Other Choices: Bogdanovich’s other big early film was his Targets, which takes on the unfortunately still current issues of mass shootings and its purported connection to films and other pop culture, all the while giving Boris Karloff one last serious film role as an aging horror film star. This entry was posted in Adaptation, Based on a Book, Black and White, Coming of Age, Drama, Movie of the Day, Period Film, The Original and tagged Ben Johnson, Best Adapted Screenplay Nominee, Best Cinematography Nominee, Best Director Nominee, Best Picture Nominee, Best Supporting Actor, Best Supporting Actor Nominee, Best Supporting Actress, Best Supporting Actress Nominee, Cloris Leachman, Clu Gulager, Columbia Pictures, Cybill Shepard, Eileen Brennan, Ellen Burstyn, Frank Marshall, Jeff Bridges, Larry McMurty, Peter Bogdanovich, Randy Quaid, Sam Bottoms, teens, Texas, Timothy Bottoms. was bogdonovich’s wife’s idea to cast cybil shephard in the movie—and he repaid her by having an affair with shepherd. the book sequel was all about jeff bridges’ character, though this movie is more about timothy bottoms—-but bridges was still a star and bottoms wasn’t, and that’s how such book sequels, with an eye on a movie adaption, are written.